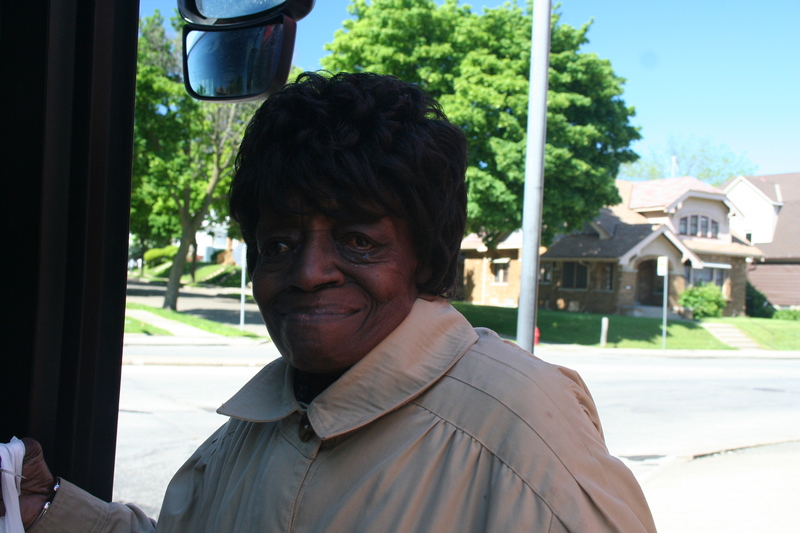 Evelyn Smith teeter-totters down the sidewalk of North Teutonia Avenue in Borchert Field, grocery bags in hand. She stops in a triangle-island at the corner of Burleigh Street to wait for the bus she’ll catch home. The 70-year-old was born in Canton, Miss., but her parents came to Milwaukee in 1949 when Smith was only 5 or 6 for “the reason everybody else came up here”: better jobs. “We stayed in different places. We stayed on Market Street, then we moved into a projects called Westlawn and then we moved over on 24th and Locust,” she says. I doesn’t bother Smith that she didn’t get to use that education. Of the medical terminology, in particular, she says, “I just couldn’t hack it.” But she didn’t care about getting a particular job as much as she wanted to go to school for herself. After she retired, Smith was finally able to find something she loved, working as a crossing guard for 13 years. “I love kids and have fun talkin’ to ‘em,” she says. “It hurt my feelings when people [would] ask me if I had any children, I said ‘no,’ and they’d talk about, ‘Oh, you lucky.’ Nobody should say that; you don’t know how a person feels,” says Smith. “Some people don’t have what you have, you know, and some people are blessed and don’t even say, ‘Thank you Jesus for waking me up this morning,’” she says. Did you find value in Evelyn’s story? If so, please subscribe to our newsletter; we publish the story of a different Milwaukeean every week.